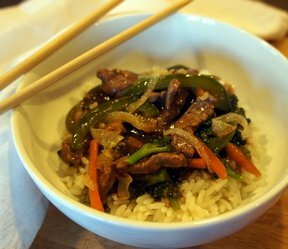 A tasty Asian inspired stir fry filled with vegetables, beef and a thick sauce. The fresh ginger is the key to a great Asian sauce. This stir fry will fast become a favorite in your house. In a small bowl, combine 1 tablespoon soy sauce, 1 tablespoon sherry, garlic powder and 1 tablespoon cornstarch. Set aside. In a small saucepan, combine water, bouillon and minced ginger. Bring to a boil; simmer 10 minutes. Let cool. Add hoisin sauce, 1 1/2 tablespoons soy sauce, 1 1/2 tablespoons sherry, 1 1/2 tablespoons cornstarch and red pepper flakes. Set aside. Heat wok to 325Â°. Add oil and stir-fry the meat about 2 minutes. Add onion and garlic; continue to stir-fry about 2 minutes. Add celery and cook for 1 minute. 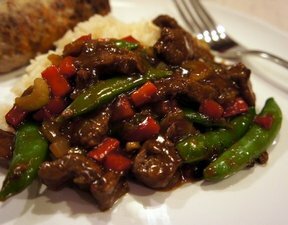 Add sweet pepper, snow peas and mushrooms, if desired. Stir-fry 2 more minutes. If desired, add sprouts and cook 1 minute. Combine liquid mixtures and pour sauce over meat and veggies. Stir until thickened. Serve over hot cooked rice. "This sauce is amazing! I didn't quite understand the 2 sauces, but I will do it again because it is really good. 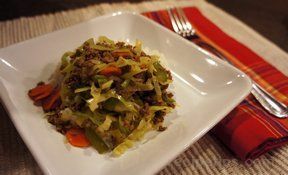 I skipped the mushrooms and bean sprouts for the kids."